Vessi’s Cityscape Sneakers go where no sneaker has gone before... at least not without getting your feet soaking wet. Sneakers are by far the most popular form of footwear today. According to the market research firm NPD, Americans alone purchased $20 billion worth of athletic shoes in 2017, up two percent from the year before. And it’s not hard to understand why. We’re not talking about the white cross trainers your dad used to wear with high socks back in the 90s. Sneakers today combine cutting-edge style with maximum comfort. 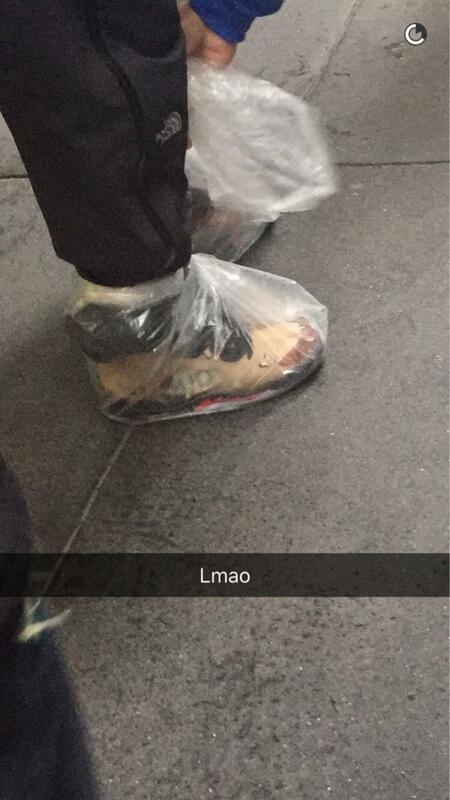 Unfortunately, as you probably know, the biggest drawback of sneakers is that most of them offer zero protection from the elements. For all their talk about cutting edge 21st century performance technology, the vast majority of shoe companies are actually stuck in the past when it comes to materials. And that means when it starts to rain, you either have to switch to boots, put plastic bags over your kicks—which is something people actually do—or accept the fact that your feet are going to get soaking wet. Fortunately, the folks at Vessie Footwear are out to change all this. Based out of Vancouver, a city that knows a lot about rain, Vessi built their sneakers from the ground up with modern urban life in mind. Their designers and researchers set out to create a shoe just as suited for the weekday grind as the weekend jaunt; something as stylish as it is practical. And with the Cityscape sneaker, they hit it out of the park. The Cityscape is sleek and modern with just a pinch of retro sneaker vibe, and it comes in five different colorways, as well as both men’s and women’s options, to suit just about any style. Like a lot of sneakers on the market today, the Cityscape is light as a feather, which means you can give your feet a break from wearing those heavy boots in winter months. Unlike a lot of other sneakers, however, the Cityscape is 100 percent vegan, made entirely with ethical, animal-free products. It’s also stretchy and breathable, which makes it insanely comfortable. And anti-microbial soles mean you can go sockless without worrying about the smell factor. But of course, the Cityscape’s waterproof technology is probably its biggest selling point. Cityscapes are not made with traditional waterproofing material. Instead, they’re made with a brand new type of material called “Flash Knit” (Cool name, right?). It’s a stretchy, moisture wicking fabric composed of three different layers. The outer layer is made from a blend of yarn and designed to stretch and contour to the shape of your feet. The middle layer is a waterproof membrane powered by nano-filtering technology, which basically means it has millions of tiny holes big enough for moisture to escape, but too small for anything else to get in. The inner layer is soft, stretchy, form-fitting, and moisture wicking. Originally launched via Kickstarter, the Cityscape is now available for purchase online. So if you’re on the market for some new shoes that feature cool tech, ethical materials, supreme comfort, and contemporary style, this is where you want to start.